We are celebrating with our partners and friends at Bayard, Inc. for accolades earned for their site CatholicDigest.com. Bayard, Inc.Â was recently awarded First Place in the category of "Best General Publisher Website" by Catholic Press. It was said by one of the judges, "This was an easy decision to make as this entry stood out among its peers. This web page provides a lot of information without being cluttered, successfully integrates and applies a variety of design principles and yet establishes a strong identity for its readers." In February 2010, The A Group partnered withÂ CatholicDigest.com toÂ re-launch their site. 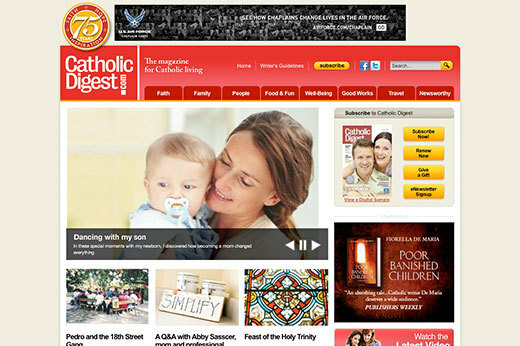 The objective for the new website was to find an easy way to serve on-line readers with an extension of the printed magazine in its 75th year.Â Through resources, devotions, articles and blog entries,Â CatholicDigest.com demonstrates that a life guided by faith can be exciting, challenging, enlivening, and joyous. Thank you, Bayard, Inc. for letting us partner with you on such a quality project.